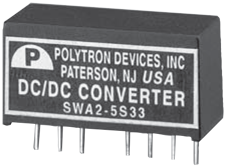 Our 2 watt single and dual DC-DC converter offers continuous short circuit protection and has low ripple and noise. This design also features an external on/off control and a miniature single inline package (SIP) of 0.86" x 0.36" x 0.44"
Miniature SIP 0.86" x 0.36" x 0.44"
Input Surge Voltage: 100mS max. Reflected Ripple Current: External Capacitor at Input. Output Power: 2 watts max. Temperature Coefficient: ±0.1% °C max. Isolation Capacitance: 300 pF, max. * The SWA2 meets level A & level B conducted emissions only with external components connected before the input pin to the converter.